How many knee-high boots do you own with nary a zipper in sight? Exactly! Since zipper access on a tall boot is almost always a necessity (even most lace-up variations are just for shoe, with zippers obscured on the inside panels), why hide it? 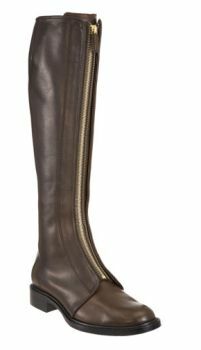 Givenchy has elevated the zipper to the spotlight – instead of trying to keep it out of view, it’s the main attraction of the riding boot. Featured prominently swooping up the dead center of this overtly smooth and minimal boot, this heady gold zipper looks far better on deep chestnut leather than the spiffy black version. 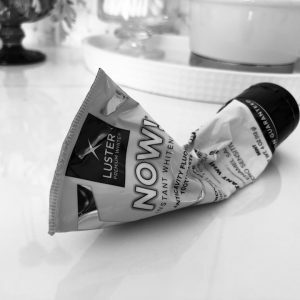 Set in a position like this, it doesn’t need to stand out anymore than it already does. Gold and brown makes for a cohesive combination. And this slim style makes for a quick zip on-and-go shoe. They might not be the most thrilling of purchases, but we always are in need of a good pair of flat boots prepared to trek you through rough weather. In sleek Givenchy, you can at least do it in style. At Barneys New York for $1,495. 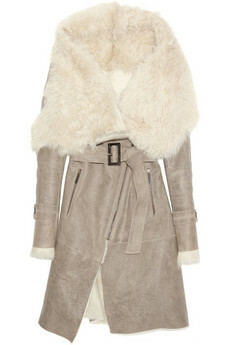 Pair with: Keep warm and look glamorous in Karl Donoghue’s shearling biker coat. Vanilla shearling over textural gray leather, along with minimal bronze hardware, will cement a naturalistic palette. On Net-a-Porter for $2,420. This is a wonderful pair of boots. I have already purchased my boots for fall/winter, but if I had seen these earlier….